I imagine being the “crème de la crème” sounds tantalisingly delicious to children of an impressionable age. For one, foreign words to young ears always sound exotic and important, for another, it is the sort of phrase likely to be picked up from an adult, and most children wish to be older than they are, and, really, what is better than a cloud of thick cream? Miss Jean Brodie is a young teacher in her prime, who carefully cultivates the young girls she teaches so they have a chance at becoming the “crème de la crème”, in her words, although I get the feeling that even Miss Jean Brodie is still aspiring towards that very feat, and hopes it will come to her at the end of her prime. Reading Muriel Spark’s 1961 novella The Prime of Miss Jean Brodie is like eating a mini chocolate donut: you want the experience to last and therefore take small bites, while at the same time wishing you could devour it whole because it is just that appealing. But by the end of it you are satisfied, because anything bigger than that would ruin the experience. This book is one of those ones which I’d heard so much about and yet still never really quite knew what the book was about. Having now read the book, and thoroughly enjoyed it, I’m still not quite sure precisely what the book is about, apart from a Miss Jean Brodie in her prime. Jean Brodie is a wonderful character. I found it impossible not to admire her, even though I despised her at the same time. She is admirable for her strong-headedness, and her complete and utter belief and faith within herself. Miss Jean Brodie takes her class under her wing each year and teaches them what she thinks they should know, which very rarely matches the official school curriculum. 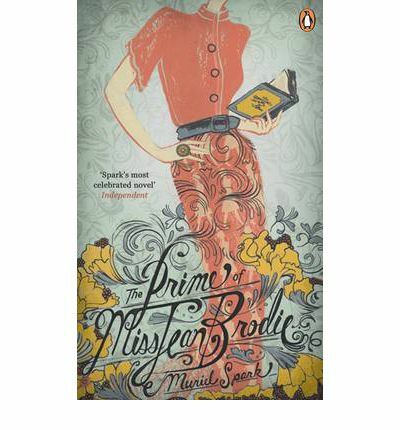 This book follows six girls who are Miss Jean Brodie’s chosen ten-year olds, and who become known as the Brodie set. The girls are shaped by their teacher’s influence long after they leave her care, into their high school years. The Brodie set are keen to keep themselves apart from the rest of the students, and Miss Brodie continues meeting with the girls throughout their school years, cultivating her young charges into what she believes they should aspire to. In other words, manipulates the way her students think and act. And this is where the despising sets in: her compulsive need to play her students against each other is cruel, to the point where the teacher is responsible for some of the girls’ unpleasant fates. The novel jumps from future to past to present, dropping little pieces of Miss Brodie’s past and the Brodie set girls’ futures into the story. Through these pieces of information we learn of the fate of the Brodie set and of Miss Jean Brodie herself. Spark achieves these jumps in time seamlessly, stitching snippets of information into the main narrative, leaving the reader with nothing more than what they need to know. The Prime of Miss Jean Brodie is a little bit shocking, a little bit surprising and extremely entertaining. Spark’s characterisation is what really drives this novella, and her creation of the identities of the Brodie set and Miss Jean Brodie herself are what propels this story forwards. If you have not yet immersed yourself in the world of Miss Jean Brodie in her prime, I highly recommend allowing yourself an afternoon to discover one Jean Brodie and her set of girls. It is an afternoon well spent. This entry was posted in Arts, Books and tagged book review, books, books you should have read by now, classic, literature, Muriel Spark, novella, Review, school, the prime of miss jean brodie. Bookmark the permalink.